“Dear Soldier, Today is Halloween so, along with this cup of coffee, I thought I’d send you a scary story. My 8-yr-old daughter decided she wanted to be a Monster High girl for Halloween. On the off-chance that the Dept. of Defense does not issue Monster High Dolls with your combat boots and you are unfamiliar with them, simply imagine fashionable werewolves, vampires, etc who go to a super-cool high school. As far as I can tell, there are 10 girls and 1 boy at this high school. As always, COJ lets you send any amount of coffee to deployed servicemen and women for only $2 a cup. You can check the pen-pal option or not check it. Either way, most times you’ll receive a thank-you note. It’s a small thing but a terrific way to boost someone’s morale. If you’ve never tried it, I have to tell you it really is a great program. A while back I happened upon a blog called Military Special Needs Network. Each staff writer is a military family member with a special needs child (or children.) They created this network to share information, inspire, empower, and connect other families in the same situation. They were also kind enough to help me with one of my soldiers who was facing difficulties. I am very grateful for that. Sometimes when I read their blog I learn about things specific to our military families. Sometimes I gain a deeper understanding of the special needs world in general. And there are topics any parent could relate to. Like finding a great Halloween costume. Until the other day, I never knew there was such a thing as Adaptive Costumes. 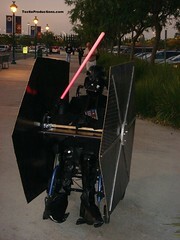 In their post, Adapting Halloween, one of the links was for a great Pinterest page with adaptive Darth Vader, Batmobile, a little girl who turned her crutches into the front legs of her giraffe costume, and more. The creativity, the joy, the spirit…these kids looked great. And I think they knew it. Their smiles made my smile even bigger. That’s one of the things we all want. To make the people we love happy. And sometimes, to make strangers happy too…with or without the aid of monsters. Happy Halloween!